■ITU-AJ offers facilities for reading literature and research data on the ITU and the Asia-Pacific Telecommunity (APT) . ■ITU-AJ also answers specific enquiries from the public regarding technical matters, the ITU, the APT, and so on. ■ITU-AJ issues monthly Japanese-language ITU Journal to spread information relating to the ITU and the APT among relevant Japanese organizations. This includes details of the activities of international organizations and trends in international cooperation in the telecommunications field. ■Since its launch in 1989, New Breeze, ITU-AJ’s quarterly English-language magazine, has been publicizing Japanese telecommunications and broadcasting policies, services, technologies, standardization activities and industry trends. As a comprehensive publication, the aim of New Breeze is to provide information on the Japanese situation to telecommunication and broadcasting businesses and organizations overseas, as well as to English speakers in Japan. ■Through the annually published World ICT Visual Data Book, ITU-AJ provides timely information on the status of telecommunications in both developing and developed countries. The book includes comprehensive tables of easily compared international statistics. 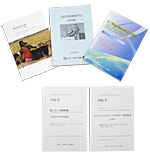 ITU-AJ publishes a bilingual Japanese-English edition of the ITU Constitution and Convention, the Union’s basic legal instruments. It also publishes in Japanese a chronology of the ITU, which makes clear its activities and Japan’s participation, as well as several other titles. ■ITU-AJ acts as an agent for the sales of ITU publications regarding the ITU Constitution, Convention, Regulations and research reports, as well as Recommendations of the ITU-T, ITU-R and ITU-D sectors and research reports by ITU-D.
■In 1996, ITU-AJ opened a website that provides information on its activities, in English as well as Japanese．In 2007 ITU-AJ added members-only webpages which contain periodicals and the materials from workshops conducted by ITU-AJ.